Ahh – the saga continues. Though I peripherally noted this in a previous post this deserves a post of it’s own. Nature Publishing Group has a policy of making genome sequencing papers freely available. Alas, not all such papers have in fact been made freely available (see Hey Nature Publishing Group – When are you going to live up to your promises about “free” genome papers? and A Solution to Nature Publishing Group’s Inability to Keep Free Papers Free: Deposit them in Pubmed Central for more on this). But I have discovered a just painful though funny absurdity with NPG’s money making machine. They have in fact made the Lander et al. Human genome paper from 2001 freely available. But there is an Erratum to this paper. 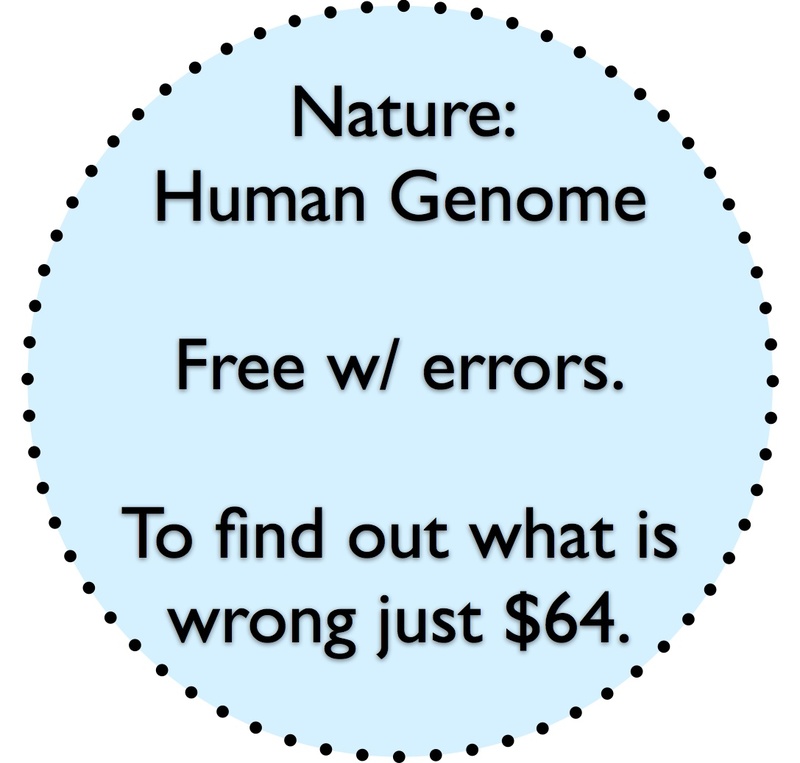 And if you want to get it (and without getting it there is no way to know what is being corrected), you have to pay $32: Access : erratum: Initial sequencing and analysis of the human genome : Nature. Oh, and in addition a Correction “We have identified several items requiring correction or clarification in our paper on the sequencing of the human genome” for this paper also costs $32. So the incorrect version of the paper is free but the corrections will cost you $64. Next Next post: Corrections Scamming at Nature: Tantalizing clues, to see errors just pay more money #Seriously?